The 12" Stainless Steel Red Scalloped Coated Handle Tong is inexpensive, sturdy and comfortable to hold. The tongs do line up when pushed together. They are great for everyday use. This 12-inch scalloped tong is especially very good to use when serving food in steam pans. The red coated handle makes it safer the customers to handle food. I like the quality of these tongs. When I squeeze them they line up properly. I use them mostly for picking up french fries, and they do a great job. I can't have enough of these 12" Stainless Steel Red Scalloped Coated Handle Tong. I find that they can be used for pretty much anything...You can use it on the grill flipping your meats; salad bars serving your salads, fruits and vegetables. I love the coated handle which makes it safe when using it on the grill. i highly recommend this tong. Great tongs. I love the tension on the spring back without any springs! I don't like the ones with actual springs because they break overtime. These tongs are fantastic. I love the color. They do a really good job at gripping things thanks to the scalloped edges. The handle is also really comfortable. Stainless steel red handle tongs are the greatest addition to my food business, very sturdy and durable can hold up to the extreme heat great product to have. These tongs are awesome for the price. They never lose their resistance at all. I have 1 tong that the coating started falling off after a year or so but out of 6 of them..I can't complain. I tried a pair to see what I would get for that ridiculously low price and was pleasantly suprised. These tongs are as strong and durable as any others out there for an incredible price. They have a great feel in your hand and are functional. They are quite ergonomic and feel like an extension of my hand. You can't go wrong with this product. I'm ordered several more pairs of these for every station in my kitchen, in every color to prevent cross contamination. I highly recommended this product. Absolutely love these! Coating on the handles withhold the heat. Great price in comparison to other online stores. Would definitely recommend to other "cooking" friends. Big fan of these tongs, the red handle makes it easy to grip and the scalloped ends make it easy to grab any of our meats which is nice. We like these color coded tongs. They are quality made and we use the different colors for different things. We use the red ones for when we cook pork. Great set of tongs, much better than spring loaded one's. Highly recommend these as they're very durable and easy to use. Great price as well. I love the red coated handle. these are a great buy! They're nice and long which really comes in handy when doing things like BBQ or reaching into a hot oven. I love that they're stainless steel, the durability and quality for the price is simply unmatched. These handles are nice in that you never have to worry about the spring going bad on them. They keep some of the heat off of them. 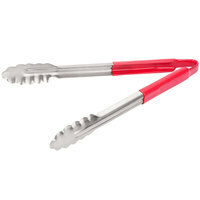 We love having the red handlers tongs to prevent any cross contamination. They stick out like a sore thumb and they work as you would expect the tongs to work. These seems sturdy and will last the test of time. I enjoy these better than the 3 piece... BUT you will have to buy them overtime as the they dont spring back after awhile. We initially bought these 2 years ago, and they have done really well. I am surprised at how well the rubber coating holds up after going through the dishwasher so many times. We have other tongs which we paid a lot more for, that have just sat in the utensil drawer without use for the past 2 years because these do circles around them in function and quality. A steal at this price. We even bought them to donate to a charity fundraiser auction with some nice kitchen items. They were a popular item. Great handy size. Bold color! Great tongs. I bought these for home use, they work well with inside cooking and outdoor grilling. These will be something I will get a lot of use out of! I bought a few of these. At first they were great to reach further on our counter but just a few months and one has already broken. These tongs are very sturdy and work great. I love the red handle as it does not get hot and reminds the cooks to only use these on cooked meat. These are nice and long thongs. They work great for taking food out of the fryers. The red rubber grip helps to prevent burning of hands. These Tonga are quality but the rubber handle falls off with time however the tong still works great with out the color handle. Strongly recommended. These color coated tongs are perfect for keeping separate. Raw vs. cooked product. I just wish they weren't so tight. They're do kill the hands. The tong has perfect lengh for my use. Material is good. The only thing that I don't impress with it is it is hard to squeeze. You have to grab it thight enough to hold food. Overall is ok.
Used the 12" Stainless Steel Red Scalloped Coated Handle Tong to pick up a Chocolate chip cookie wafer. Even though the wafer was very thin the tongs had no problems picking it up. Great tongs. Great quality! These tongs are far superior to the ones with springs and pins. No food gets stuck in the handles and never pops open. At the price these 12" Stainless Steel Red Scalloped Coated Handle Tongs are easy to use, and very economical. The plastic coating ensures a good non slip grip when in use. I use these 12" stainless steel red scalloped coated handle tons to pick up meat in my kitchen. The red color indicates that this is for meat use only. These red tongs are pretty cheaply made, with the rubber coating peeling back and the metal not feeling very nice. 12 inch tongs are staples in our kitchen, so we will be going with another kind. The chef swears by these tongs. These are the only kind allowed in our kitchen. He loves that they are study and have a great grip. I love that they clean easily and don't rust. color coded good for kitchen use not to big not to small. ez to clean. strong but not hard ez to use. buy more save more. great one nice and handy easy to use great for everything frying serving and more high quality coated tong and i love the color of this coated tong in 12 "
These tongs are very sturdy and well built. The red handle helps keep our hands from getting burnt and we use it as a point which is not to be in contact with food for training. We will order more. These are nice, basic tongs. The rubber grip is nice, but the handle feels a bit wobbly when trying to close the arms together. Overall, for the price, they are good tongs. Meets all local and state standards, holds up to the use from the staff. Well manufactured and Great shipping. Everything is always on the spot! Nice rubberized coating for easy grip. We used this 12" red handle for meats or other food safe items. The long reach is perfect and because of the color we knew where the tongs belonged. We never mixed red with yellow. The springless design is the way to go. Before we used spring tongs (with that tight built in spring) and they would snap out of bins and throw food everywhere. These ones are less wound up. We've used these tongs for 4 years and they are holding up great. The different colored handles make it easy to separate them when using them for different types of food. This pair of 12 inch tongs was actually a gift for a friend, she "borrowed" my pair and I ordered these for her to get mine out of her kitchen. I love these because they are sturdy and not at all flimsy like most store bought tongs with the slippery plastic coating on the tip. The handle is long enough to use on the grill and I throw them in the dishwasher. So far the coating on the handle part is still in tact and doesn't show any signs of wear. I can see though where this material would begin to deteriorate over time and through many washes in the dishwasher. If thats the case, I will just hand wash and buy another pair, cant beat the price. Highly recommended to purchase for home kitchen use and dont take these to potlucks!! You may never see them again! Nice coated BBQ tongs allowing you to reach in the back of the grill with a comfortable grip. The price is higher but is brand produces quality products and nobody beats these prices.